A stroke is a serious medical condition that requires emergency care and can cause lasting brain damage, long-term disability or even death and therefore an earlier diagnosis is of utmost importance for timely intervention to halt the complications.U.S. Food and Drug Administration,FDA has permitted marketing of the Viz.AI Contact application, a type of clinical decision support software designed to analyze computed tomography (CT) results that may notify providers of a potential stroke in their patients.The Viz.AI Contact application is a computer-aided triage software that uses an artificial intelligence algorithm to analyze images for indicators associated with a stroke. Artificial intelligence algorithms are a type of clinical decision support software that can assist providers in identifying the most appropriate treatment plan for a patient’s disease or condition. 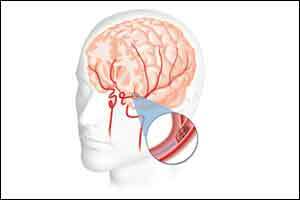 A stroke occurs if the flow of oxygen-rich blood to a portion of the brain is blocked, also known as an occlusion. According to the Centers for Disease Control and Prevention, stroke is the fifth leading cause of death in the U.S. and is a major cause of serious disability for adults. About 795,000 people in the U.S. have a stroke each year. “Strokes can cause serious and irreversible damage to patients. The software device could benefit patients by notifying a specialist earlier thereby decreasing the time to treatment. Faster treatment may lessen the extent or progression of a stroke,” said Robert Ochs, Ph.D., acting deputy director for radiological health, Office of In Vitro Diagnostics and Radiological Health in the FDA’s Center for Devices and Radiological Health. The Viz.AI Contact application is a computer-aided triage software that uses an artificial intelligence algorithm to analyze images for indicators associated with a stroke. Artificial intelligence algorithms are a type of clinical decision support software that can assist providers in identifying the most appropriate treatment plan for a patient’s disease or condition. The FDA is currently creating a regulatory framework for these products that encourages developers to create, adapt and expand the functionalities of their software to aid providers in diagnosing and treating diseases and conditions. The Viz.AI Contact application is designed to analyze CT images of the brain and send a text notification to a neurovascular specialist if a suspected large vessel blockage has been identified. The algorithm will automatically notify the specialist during the same time the first-line provider is conducting a standard review of the images, potentially involving the specialist sooner than the usual standard of care in which patients wait for a radiologist to review CT images and notify a neurovascular specialist. The notification can be sent to a mobile device, such as a smart phone or tablet, but the specialist still needs to review the images on a clinical workstation. The Viz.AI Contact application is intended to be used by neurovascular specialists, such as vascular neurologists, neuro-interventional specialists or other professionals with similar training. The application is limited to analysis of imaging data and should not be used as a replacement of a full patient evaluation or solely relied upon to make or confirm a diagnosis. The company submitted a retrospective study of 300 CT images that assessed the independent performance of the image analysis algorithm and notification functionality of the Viz.AI Contact application against the performance of two trained neuro-radiologists for the detection of large vessel blockages in the brain. Real-world evidence was used with a clinical study to demonstrate that the application could notify a neurovascular specialist sooner in cases where a blockage was suspected. The Viz.AI Contact application was reviewed through the De Novo premarket review pathway, a regulatory pathway for some new types of medical devices that are low to moderate risk and have no legally marketed predicate device to base a determination of substantial equivalence. This action also creates a new regulatory classification, which means that subsequent computer-aided triage software devices with the same medical imaging intended use may go through the FDA’s premarket notification (510 (k)) process, whereby devices can obtain marketing authorization by demonstrating substantial equivalence to a predicate device. The FDA permitted marketing of the Contact application to Viz.AI.